The Voodoo shop downtown has been open for literally a hundred years. Now, has the same lady run the joint for the whole time? That's up for debate. All we know is that until recently we didn't even know it existed. The signage is pretty subtle. The front display window is shadowed in white old-lady lace and layered with green vines from some kind of plant that's been hanging from the ceiling for more than a couple decades. Then the Voodoo lady's granddaughter introduced her to Instagram and her store is now popping. This store has secretly been on trend the whole time! She's got the standard potions and charms but she's also got jewelry with bones and feathers that is sure to keep you safe from hungry ghouls. Whether Mabel likes it or not, her Voodoo store is the hottest thing around right now. That's just what happens when you're so charming! This lovely necklace isn't from a Voodoo shop but it looks just as cool! The layered look will stand out no matter what you're wearing it with. 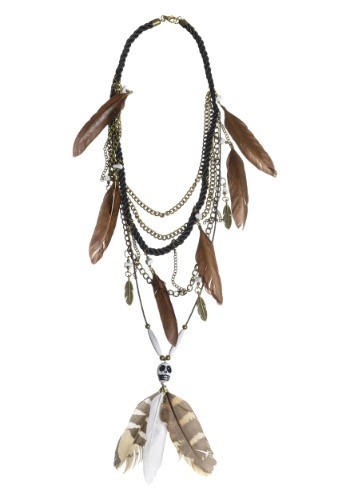 The long necklace has brown feathers scattered throughout for a magical yet natural look. There is also tiny silver feathers and a skull at the very bottom that connects to three real feathers. Maybe you don't have a local Voodoo store run by the same lady for a hundred years. That's alright, we've got enough lovely Voodoo accessories to make your magic costume look like the real deal. From staffs to all-out costumes, you'll have plenty of options. If you pull this off right, you might be like Mabel, the local Voodoo matriarch!